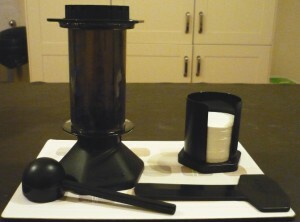 Since the Aeropress Coffee Maker came out it has been slowly dropping in price by about £1 a year and I was waiting for it to hit a sensible level. It suddenly dawned on me that this was a ridiculous way to think about it, so I bought one immediately. Made by Aerobie (yes, the same company that makes the flying disk that goes for miles! 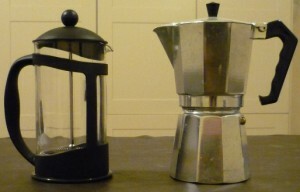 ), the AeroPress Coffee Maker was supposedly the result of some bloke’s years of research. It’s basically a giant filtered syringe, but don’t let that put you off as it is very easy to make nice coffee with it. I won’t pretend I have any idea about what good coffee is, but I do know I’ve been using it pretty much every day since it turned up in the post. It’s pretty straightforward to use: put a filter in the cap and tighten it on, put coffee then hot water inside, stir, leave it for a short time then put the plunger in and press down slowly. To clean, you then twist off the cap and push the plunger through which ejects the coffee grounds and the filter paper as a ‘puck’. I then rinse off the end and put it all back in the cupboard. Considering the fuss with every other method I’ve used, this does the lot in under two minutes, and that’s with less than a week’s practice. The picture above shows how you would use it. The plunger doesn’t push directly against the coffee and water mixture, but compresses the air above. As I don’t know much about coffee, there’s not much more I can tell you really. It’s quick, easy and clean and makes nice coffee. Feel free to comment below if you’ve used one! If you fancy one yourself, you can get them from Amazon UK .